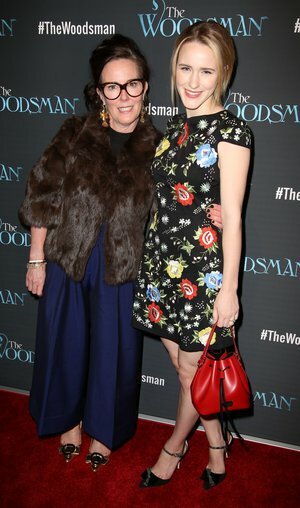 Rachel Brosnahan is revealing how she saw her aunt, Kate Spade. Kate's apparent suicide on Tuesday at her Manhattan apartment shocked fans and devastated her family. The fashion designer, who was married to her business partner Andy Spade and shared a 13-year-old daughter with him, Bea, also had a pretty famous family. Her niece is Golden Globe winner Rachel Brosnahan and her brother-in-law is actor and comedian David Spade. Rachel shared a touching video on Instagram on Wednesday of her aunt and uncle dancing in front of a mariachi band, seemingly having a blast on vacation. Kate and Andy are smiling, happy and seem to be more in love than ever. Rachel captioned the video, "Knowing Katy, this is how she would want to be remembered. She had a light that words can’t capture but touched everyone she came into contact with. She was exceedingly kind, beautifully sensitive, insanely talented, funny as heck and one of the most generous people I have ever known. She was effervescent. Hug your loved ones extra tight today." Kate reportedly hung herself with a scarf at her Manhattan home and was discovered by a housekeeper on Tuesday. She had reportedly left a note that was addressed to her daughter, Bea, letting her know that her death was not her daughter's fault. TMZ reported that Kate was extremely depressed in the days before her suicide because her husband, David, wanted a divorce and was already living separately in a nearby apartment. Despite the tragic circumstances, Rachel's video shows off another side to her aunt's personality – filled with light and joy.